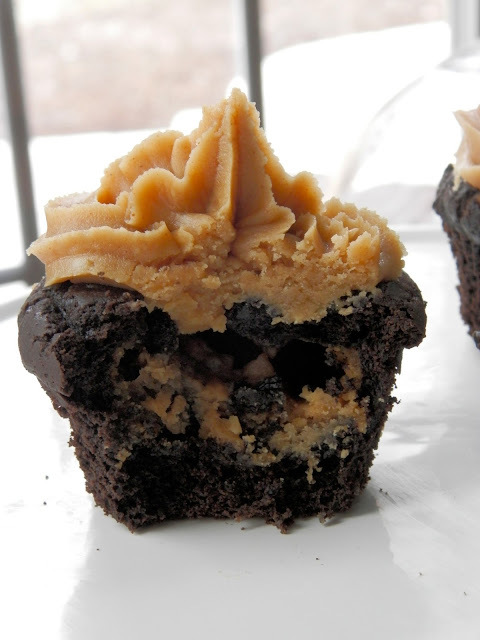 The story behind these is simple: I was in the mood for Reese's (nothing new), and saw these on FoodGawker, and whenever I thought about baking, my mind kept wandering back to them. When you're in the mood for cupcakes and Reese's, (I can't imagine when you wouldn't be...) these are perfect. What makes these so much better than just peanut butter-filled cupcakes is that the filling isn't just peanut butter, but it's like the peanut butter from a Reese's. You know, the peanut butter that's super sweetened and isn't creamy but more clumpy but melts in your mouth and is oh-so-delicious? It tastes like that. And then the frosting! Wowee, it's delicious. It's a family classic of ours- we originally found it in The Cake Mix Doctor for my 11th birthday cake, and for the past 2 (soon to be 3, as of May 5th ;)) years, we have used it for any and all of our peanut butter frosting needs. It is amazing and creamy and peanut buttery and sweet and delicious. Honestly, the cupcakes themselves did not steal the show, so if I were to make these again I would be tempted to use the cupcake recipe from the Flourless Chocolate Cupcakes that I made. But if you're just looking for a good old chocolate cupcake, these will do fine. I am just recently obsessed with flourless chocolate cake, which you can learn about if you click on the link above or to the left. Now I bet you're hungry enough to go make some. You're welcome in advance. Preheat oven to 350 F. Line a muffin tin with 12 cupcake liners. To make the filling: Combine the confectioners’ sugar, peanut butter, butter and vanilla extract in a bowl. Beat with an electric mixer on medium speed until well combined. Roll the mixture into 1-inch balls (at least 24) and set aside on a baking sheet. To make the cake batter: Combine the flour, cocoa powder, baking soda and salt in a medium bowl; whisk together and set aside. In a liquid measuring cup, stir together the sour cream, milk and vanilla extract. In the bowl of an electric mixer fitted with the paddle attachment (I used a hand mixer), combine the butter and sugar, and beat on medium-high speed until light and fluffy, about 2 minutes. Beat in the eggs one at a time, scraping down the bowl as needed. With the mixer on low speed, alternately add the dry ingredients and the sour cream mixture, beginning and ending with the dry ingredients. Mix just until incorporated. Spoon a tablespoon or two of batter into the bottom of each cupcake liner. Place a ball of the peanut butter filling in each cupcake well and top with the remaining batter so that all the cups are filled. Bake for 18-22 minutes, or until a toothpick inserted in the center comes out clean. Allow to cool in the pan for 5-10 minutes, then transfer to a wire rack to cool completely. When the cupcakes are completely cool, top with peanut butter icing. For peanut butter frosting: Place the peanut butter and butter in a large mixing bowl. Blend with an electric mixer on low speed until fluffy, 30 seconds. Stop the machine. Add the confectioners’ sugar, 3 tablespoons milk, and the vanilla. Blend with the mixer on low speed until the sugar is well combined, 1 minute. Increase the speed to medium and beat until the frosting lightens and is fluffy, 1 minute more. Blend in up to 1 tablespoon milk if the frosting seems too stiff.